Some government screw-ups are so epic that they require decades of effort. Such was the case for the recently cancelled plan to convert surplus weapons-grade plutonium into nuclear fuel. Not only did the U.S. waste $4 billion dollars, it increased the likelihood that terrorists could obtain bomb-making materials. It sounded like a good idea at the beginning. Let's turn megatons into megawatts! In 2000, the United States and Russia signed the Plutonium Management and Disposition Agreement (PMDA). Each country pledged to dispose of at least 34 metric tons of plutonium from their nuclear weapons programs. U.S. nuclear weapons contain less than four kilograms of plutonium, so the combined total of 68 metric tons is enough for some 17,000 nuclear weapons. Disposing of this plutonium would make it more difficult to reverse U.S.-Russian nuclear weapons reductions and would prevent terrorists from gaining access to the material. The United States settled on a plan to convert most of its surplus plutonium into fuel for nuclear reactors. A massive reprocessing plant would be built at the Savannah River Site in South Carolina, which, during the Cold War, had refined nuclear material for deployment in warheads. Now, the site would have a new mission: creating nuclear fuel from a mixture of plutonium and uranium oxide, otherwise known as mixed oxide fuel, or MOX. Although nuclear power plants in the U.S. use fuel made from low-enriched uranium (LEU), other countries had demonstrated that MOX was a viable alternative. Instead, the final outcome was a mothballed facility and a still-increasing supply of surplus plutonium. Like I said, this isn't your typical government boondoggle. It was twenty years in the making. When Bill Clinton came to the White House, it became apparent to his administration that surplus weapons-grade plutonium would begin to pile up quickly. The Start I and II treaties—along with unilateral pledges made between Presidents Bush, Gorbachev and Yeltsin—meant that thousands of nuclear weapons would be retired within the decade. "The existence of this surplus material constitutes a clear and present danger to national and international security," warned a 1994 report published by the National Academy of Sciences. The more plutonium we had lying around, the greater the risk that it could be stolen and used by terrorists, or sold on the black-market to less-than-friendly countries. Although building a nuke with plutonium is more difficult than making one with highly enriched uranium (HEU), less material is needed to create an explosion of equal size. Likewise, radiological weapons ("dirty bombs") that dispersed plutonium instead of HEU could cause hundreds to thousands of additional cancer deaths. I went to one 50-year-old warehouse, one of the oldest buildings at the site and, you know, went—and found 12,000 canisters, coffee can-sized canisters of plutonium there, 30,000 tons. So, you know, any two of these 12,000 canisters would be sufficient to make a Nagasaki-type bomb. They had lots of guards around. There was even a fence around the city. So, they were well-protected against some kind of attack, you know, the Green Berets or something like that, but they had almost no protection against an inside job. They had no surveillance, no television cameras or sensors inside the building to detect if there was somebody in there that shouldn't be. In 1994, Bill Clinton and Boris Yeltsin agreed, in principle, to limit and gradually reduce the U.S. and Russian stocks of military plutonium. The question, still to be decided by the two nations, was how to get rid of it? The National Academy of Sciences report recommended MOX as one of the least-worst options. Other countries, notably France, already had facilities for processing plutonium into MOX, so it was a proven technology. The U.S. could likely build its own MOX facility within a decade. In the current nuclear fuel market, the use of plutonium fuels is generally more expensive than the use of widely available low-enriched uranium fuels—even if the plutonium itself is "free"—because of the high fabrication costs resulting from plutonium's radiological toxicity and from the security precautions required when handling it. As a result, while most of the world's roughly 400 nuclear reactors could in principle burn plutonium in fuel containing a mixture of uranium and plutonium (mixed-oxide or MOX fuel), few—and none in the United States—are currently licensed to do so. Gaining licenses and public approval could raise difficulties. The subsidy required to transform 50 tons of plutonium into spent fuel in this way (compared to the cost of producing the same electricity by the means with which it would otherwise be produced) would probably fall in the range from a few hundred million to a few billion dollars, depending on assumptions and on the specific approach chosen. There were other costs—and risks—to consider. Here's the problem with MOX: the plutonium isn't really "gone" until it's been irradiated in a nuclear power plant. Before that happens, the fuel still contains weapons-grade plutonium that can be reclaimed. The "reverse blending of plutonium with uranium would only require a modest capability for chemical processing that could be accomplished in a small-scale and easily concealable glovebox facility," says Ed Lyman, a physicist at the Union for Concerned Scientists. Any reactor that used MOX fuel, therefore, would need to be heavily secured against intrusion and theft. Some analysts have criticized the MOX option on the principle of opposing any use of plutonium in power generation. From this point of view, nations that do not possess nuclear weapons could use a plutonium-based fuel cycle for power reactors as a cover for developing nuclear weapons. If weapons states such as Russia and the United States used plutonium for power generation, according to this argument, it would be more difficult to persuade non-weapons states not to do so. An alternative to MOX, also recommended by the National Academy of Sciences, was "vitrification"—otherwise known as "immobilization" or "can-in-canister." Plutonium would be blended with high-level radioactive liquid waste and added to molten glass, which would then solidify and be sealed within stainless steel cans. The cans, in turn, would be placed inside stainless steel canisters that would then be filled with yet another batch of molten, high-level radioactive waste. Eventually, the canisters would be buried at a disposal site. The plutonium—embedded within this multi-layered, radioactive Matryoshka Doll—would be, in theory, extremely difficult to recover. Over the next two years, the U.S. government reviewed 37 different strategies for disposing of plutonium (including a proposal to shoot it into space). Ultimately, though, the Clinton administration was inclined toward immobilization. The Russians, however, wanted to go with MOX, which they saw as potential feedstock for breeder reactors. 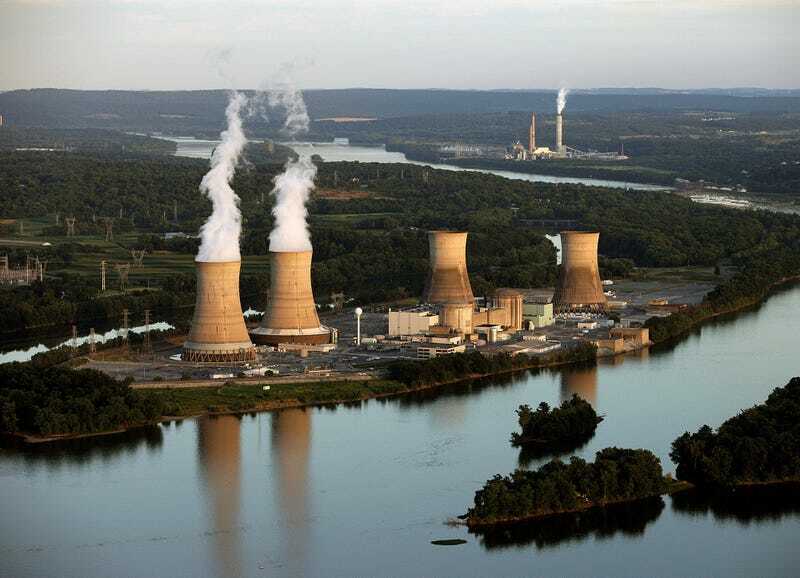 A brief explanation here: Most nuclear power plants (including the 100 operating in the United States) utilize the "once-through" fuel cycle—fuel rods undergo a controlled fission reaction to produce steam that drives turbine generators. The spent fuel rods are replaced every 18 to 24 months, put into cooling ponds, and then placed in dry storage until they can be buried. Breeder reactors, by contrast, produce more fuel than they consume. The reactor core is surrounded by a "blanket" of tubes containing non-fissile uranium 238, which captures neutrons escaping from the core and partially transmutes into fissile plutonium 239, which can then be extracted and reprocessed into more fuel. No U.S. reactors are currently licensed to be loaded with plutonium fuel, and obtaining the necessary permits would almost certainly be politically troublesome. The Energy Department says it would pay the utilities for these ''irradiation services.'' It might buy an existing reactor to do the job itself, if necessary. The Nuclear Energy Institute, the civilian industry's trade association, likes the idea of using the plutonium in its reactors. It estimates that the plutonium could make enough reactor fuel, called mixed-oxide fuel and known as MOX, to run 10 large plants for 10 to 20 years. But some analysts also think the ''irradiation services fees'' to American utilities would amount to a subsidy for uneconomic reactors. Russia would turn its plutonium into MOX fuel, but use most of it for "once-through" reactors. The U.S. would help fund the construction of the Russian MOX fuel plant. Russia would be permitted to use some of its MOX in experimental breeder reactors. The U.S. would forego the immobilization option for all but nine tons of its surplus plutonium. This compromise would become the basis for the terms formalized in the 2000 Plutonium Management and Disposition Agreement between Washington and Moscow. But, it didn't take long for the terms to change. When George W. Bush arrived in the White House, his administration had an ambitious plan to revive the nuclear power industry in the U.S. while limiting the proliferation of nuclear weapons abroad. It was called the Global Nuclear Energy Partnership (GNEP). The plan envisioned an international nuclear cartel in which the United States and other fuel supplier nations—such as Russia, Britain, France, and Japan—would operate a fuel-leasing program. These supplier nations would provide fresh fuel to conventional nuclear plants in return for user nations agreeing to forego building their own fuel production facilities—which could also be used to make weapons-grade material. A central component of the GNEP proposal would be the construction of breeder reactors in the United States. Like the Russians, the Bush administration now wanted to use MOX as feedstock. The White House promised, however, that America's breeder reactors would not produce plutonium that could be used for nukes. These reactors would use a new, super-awesome process to produce plutonium that could only be used as fuel. The process had been successfully tested on a laboratory scale, and the White House had confidence that it could be made to work in the real world. It just needed further development, at the cost of $1.06 billion. Moscow had initially demanded that Washington pay for most of the plutonium disposal project's expenses. But by 2007, the United States had only managed to corral promises of $800 million in aid — $400 million in U.S. funds, and $400 million from its allies — while Russia estimated the amount it needed was $4 billion. The shortfall allowed the Russians some wiggle room. During this period, a former U.S. negotiator recalled, the Russians were saying "more and more, 'Look, we are willing to do it your way if we don't have to pay for it. But if we are going to have to pay for it, we want to do it our way.'" Jerald Paul, principal deputy administrator of the National Nuclear Security Administration [NNSA] from 2004 to 2006, said "the Russians were constantly moving the goalposts." With a shortfall of Western aid and a new pro-plutonium policy in Washington, Russia pressed to renegotiate the deal. At a meeting in Paris in Feb. 2005, Russian atomic agency chief Alexander Rumyantsev told top Energy Department officials that "Russian plutonium disposition should be recast to focus on fast [breeder] reactors," according to a classified cable disclosed by Wikileaks. His ambition was clear: Moscow wanted the Russian MOX plant, financed by Washington, to make fuel not for standard reactors, but for a full-scale breeder program…The Bush administration agreed— with little public notice— to let Russia renege on its original promise and burn its plutonium in two breeders—breeders that could produce more plutonium. In November 2007, the U.S. and Russia signed a revised pact, which the Department of Energy extolled as "measurable progress towards disposing of a significant amount of weapon-grade plutonium in Russia." At around the same time, construction of the MOX facility began at the Savannah River Site. And GNEP? An increasingly skeptical Congress cut its funding, especially after nuclear energy experts warned that the final price tag could climb as high as $100 billion. The program was declared dead in 2009. In 2004, the National Nuclear Security Administration estimated that the Savannah River MOX facility would cost $1.6 billion. Three years later, that estimate jumped to $4.9 billion. In 2012, the forecasted expenditure increased again, to $7.7 billion. By this time, $4 billion had already been spent and the project employed more than 1,800 construction workers, designers and engineers. Then, in April 2013, an internal review conducted by the Department of Energy revealed that the total lifetime operating cost of the facility—including construction, maintenance and disposal of all the plutonium—would be $24.2 billion. The sticker shock prompted the Department of Energy to note in its Fiscal Year 2014 budget request that, "This current plutonium disposition approach may be unaffordable…due to cost growth and fiscal pressure." Any lingering doubts that the MOX program was on its last legs were dispelled when the Government Accountability Office (GAO) published a report in February 2014. Even by GAO standards, the assessment was scathing. NNSA has not analyzed the underlying, or root, causes of the Plutonium Disposition program construction cost increases to help identify lessons learned and help address the agency's difficulty in completing projects within cost and schedule, which has led to NNSA's management of major projects remaining on GAO's list of areas at high risk of fraud, waste, abuse, and mismanagement. Just one example of the poor management that led to cost overruns: NNSA and its primary contractor underestimated the number of safety systems required to meet Nuclear Regulatory Commission (NRC) requirements, which further increased equipment installation costs. More specifically, they were unaware of the costs associated with building a facility that could withstand an earthquake. The source of their confusion? The MOX facility's design is based on a similar facility in France, but the NRC regulatory requirements differ from those in France. The Department of Energy was also at fault, because it approved the initial cost and schedule estimate, when the overall design of the MOX facility was only about 58% complete. In a separate July 2006 memorandum to the NNSA Administrator, NNSA's Associate Administrator for Infrastructure and Environment expressed his concern regarding the MOX Facility project. He expressed the belief that incomplete project planning could lead to an unintended "design-build-design" process similar to that experienced by other major Departmental projects including the Waste Treatment Plant and the Highly Enriched Uranium Materials Facility. The Waste Treatment Plant at the Hanford Site was given the approval to start construction when the design was only about 45 percent complete. Since then, total project costs for that facility have increased significantly and the project is considerably behind schedule. He pointed out that, similarly, a comprehensive design review had not been conducted on the complete MOX Facility project and that the project had high-risk potential for increasing downstream costs and schedule. The White House did its part, as well. In 2010, President Obama announced a loan guarantee of $8.3 billion to help the Southern Company build two new nuclear reactors in Georgia. As a result, workers with nuclear engineering design and manufacturing experience were suddenly in very high demand. The MOX construction site had an employee turnover of 20% per year because, after workers completed additional training at the Savannah River Site, they quit to take higher paying jobs in Georgia. The U.S. government was subsidizing its own labor shortfall. Finally, in March 2014, the White House announced that it would put the whole project on "cold standby"—essentially, preparing it for shutdown—while the administration evaluated "alternative plutonium disposition technologies to MOX that will achieve a safe and secure solution more quickly and cost effectively." MOX may be mothballed, but the problem of what to do with our surplus weapons-grade plutonium remains. And, despite cool relations between Washington and Moscow, the disposal agreement still stands. The Department of Energy has established a Plutonium Disposition Working Group that will spend the next 12 to 18 months trying to come up with a plan. You can see an initial working paper here. The options are depressingly similar to the ones suggested by the National Academy of Sciences, 20 years ago. In the meantime, the South Carolina congressional delegation is not prepared to let MOX die. In April, Senator Lindsey Graham (R-SC) placed a temporary hold on the nomination of Ernest Moniz to be Energy Secretary, telling reporters that he was using the maneuver as leverage to protect his home state project. Last week, he won a committee vote to add an amendment to the National Defense Authorization Act that would resume work at the Savannah River Site. "The Obama administration's decision to suspend construction on the MOX facility is both ill-conceived and dangerous," Graham said. "The Senate Armed Services Committee took the first step in rejecting the Obama administration's reckless efforts to put MOX in 'cold stand-by.'" It's doubtful, however, that the amendment will survive a full Senate vote—especially since the GAO's latest estimate of the lifetime operating costs is now at $30 billion. And even if it somehow passed Congress and got signed into a law by the president; even if we got this facility up and working, nobody wants what it's making. The companies that run commercial nuclear reactors have lost confidence in the program. They can't be certain that it would provide a reliable, steady supply of fuel, or keep enough surplus fuel on hand in case it was needed. And why would commercial nuclear reactors purchase MOX when low-enriched uranium is cheaper, easier to transport and doesn't present a security risk? Adding to the climate of skepticism: a MOX fuel irradiation test in a commercial reactor had to be prematurely terminated in 2008 because of unanticipated problems. The loss to the United States can be measured in more than the $4 billion to build the facility and the hundreds of millions of dollars sent to Russia to subsidize their program. The greater loss is that the U.S. could have spent those funds to shore up other nonproliferation programs. An additional criticism of the [MOX] program from a nonproliferation perspective is that the high cost required to date for the plutonium disposition program in the United States is funded out of the Defense Nuclear Nonproliferation budget. There is concern that money is being taken away from other programs which some consider to have a more direct impact on preventing the proliferation of weapons-usable nuclear materials. Programs cited include the Second Line of Defense border security program or the Global Threat Reduction Initiative. Non-governmental nonproliferation experts have made recent public statements. For example, Joe Cirincione of the Ploughshares Fund has said, "funding for the plutonium fuel facility falls within the nuclear nonproliferation budget. That means that every dollar spent on unnecessary programs like MOX is one dollar less for vital nonproliferation programs that keep nuclear material and technology out of the hands of terrorists." If there's a winner in all of this, it's Russia. According to the World Nuclear Association, Russia's construction of one of its breeder reactors is "well-advanced" and it is "capable of burning 1.7 metric tons of plutonium per year from dismantled weapons." "Russia doesn't intend to dispose of its plutonium permanently," Von Hippel told the Center for Public Integrity. "In fact, it's setting itself up to produce and recycle its plutonium indefinitely." That creates risks "that this stuff will get stolen, so in fact the security situation gets worse."